Ms. Nuria Alquezar is an European Lawyer. She holds a LLB from the University of Girona and LLM in Maritime Law and Shipping Business from the Barcelona San Pablo CEU University. 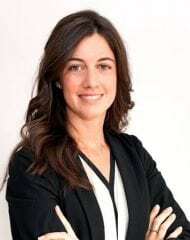 Nuria is a member of the Bar Association of Barcelona (ICAB), she advises our clients in the Spanish market and assists the firm’s senior solicitors in files related to maritime, transport and customs law, logistics & international trade. Nuria speaks English, Spanish and Catalan.